The Beta testers have been banging away on Photospector. Here are some of the questions asked about how to perform some of the more advanced tasks in Photospector. What do the color sliders control? How do I color correct a group of photos? How do I compare a color corrected image against the original? How do I get my original photos onto my iPad at full resolution? How can I edit the metadata of my photos? What are the controls at the bottom of the Image View when the Color Level Tool is active? Where do I set my Author & Copyright and the output filename? Create search albums to find images by keyword, date, aspect ratio, star rating or flag status. You can create new search albums on the Album View using the “Create Album” button at the top left of the screen. While selected, two horizontally sliding toolbars are displayed at the bottom of the screen. The upper toolbar contains a list of keywords from your images, and you can add new, personal keywords using the plus button. The lower toolbar contains a list of “smart” searches. Searches for keywords, dates, aspect ratio, star rating and flags are instantly available, while generalized “meta-search” terms, like Apple, Canon, or any other string in the bottom toolbar in Create Album mode take a bit longer as they need to read the metadata from disk for each of your photos. This search is performed in the background, so you can continue to use Photospector while the search is in progress. You can create new keywords and new smart search terms. Smart search terms are in the bottom bar and search the entire metadata for a case-insensitive string match. Keywords only look at the IPTC keyword field in the metadata. Keywords are shaped as “tags” and can be applied and removed from images using the Keyword Tag bar in the Group and Image views. Smart metadata searches are oval shaped and only look at the original metadata stored in the image file. You can combine any number of keywords and smart searches to create a new search album. Each of the tags you add to a search album will further restrict the images placed in that album — except when you add smart search tags of the same “type”. There are three different smart search types: dates, aspect ratios, and star ratings & flags. Multiple tags within each search type will broaden the set of images added to the album. For example, adding 2012 & 2013 indicates that the album should contain images from EITHER 2012 OR 2013. If you add the keyword tag for “Photospector” you will get any photo from 2012 or 2013 that also has the tag “Photospector”. If you add a second keyword, say “Glazeapp”, you will only get images that have BOTH keywords, Photospector & Glazeapp and are from either 2012 or 2013. You can create your own smart searches with any arbitrary string. We call these tags “meta-search” tags because they match the given string against all of the metadata fields for an image. If any field, or field name, matches the term, the image will be added to the album. Meta-searches are slow. All other searches are instantaneous, but meta-searches require us to load and check the metadata for all images. We don’t store all the metadata in memory since it could be enormous for large image collections, but we do hold the limited set of data we need to instantly search for flags, star ratings, dates and keywords. 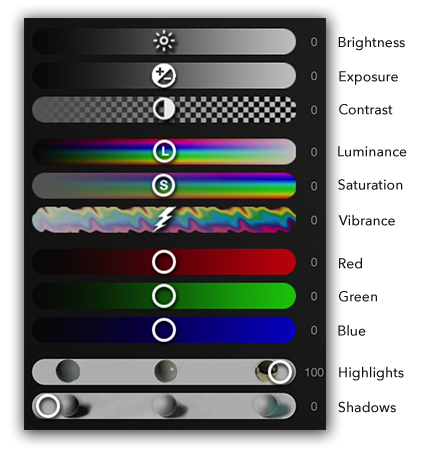 Photospector’s color adjustments all work in real-time using the GPU. At the top of the panel is a color curve tool and below it are sliders to perform common photo adjustment operations. Each section has a separate Reset button to return to the un-adjusted state. The Copy & Paste buttons at the top right of the upper navbar allow you to copy all of the color adjustment settings (color curve and all sliders) and paste them onto different images, or onto multiple images together in the Group View Edit mode via multiple thumbnail selection. At the top of the color level tool overlay is a curve tool which allows you to specify the in/out black/white points and a gamma function. The controls on the curve tool adjust all channels of the image identically using the color curve. Using the eyedroppers you can choose black/gray/white points to adjust the curves separately for each Red, Green, and Blue channel. 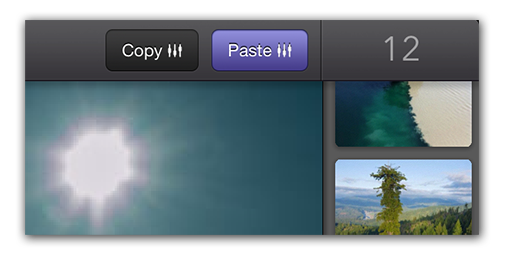 Use Copy & Paste to transfer color adjustments from a single image to other images, or to groups of images in the Group View. When the Color Level tool is active in the Image View, use the blue Copy Levels button at the top right in the navbar to copy the current color settings and then paste them on one or multiple images in either the Image View or the Group View. The paste button is disabled until you have copied one set of adjustments. You can only have a single set of copied values. Any previously copied values are discarded when you hit Copy. Using copy and paste can also be helpful while testing out various color adjustments to a single image. If you find a setting you like, Copy it to save it while you continue to make adjustments. That way you can always reset to the saved adjustments. You can toggle or wipe the original image to compare it to the color corrected one by pressing on the image icon in the Thumbnail Sidebar. Pressing and holding on the thumbnail for the current image in the sidebar will reveal the original, un-modified image. If you press and drag to the left, you can wipe between the original and the adjusted image. The “Reveal Original” icon indicates when you can press and hold to show the un-modified original image. The three vertical lines indicate that you can wipe the image in the thumbnail against the current image in the main view. You can also wipe against any other image that has the three vertical stripes on the icon in the Thumbnail Sidebar. This is useful when comparing images that are different versions of the same image. For example, if you have performed a series of operations on an image using various filter apps, you can put all those versions into a single album, perhaps using the Flag tool to select the images from the Camera Roll and then using the Flag search album. We recommend using the Photo Transfer app ($1.99). It allows you to transfer images to and from your iPad at full resolution, retaining all of the original metadata. If you transfer photos using iTunes, the images will be reduced in resolution and you will not be able to edit or inspect the original, full resolution images. 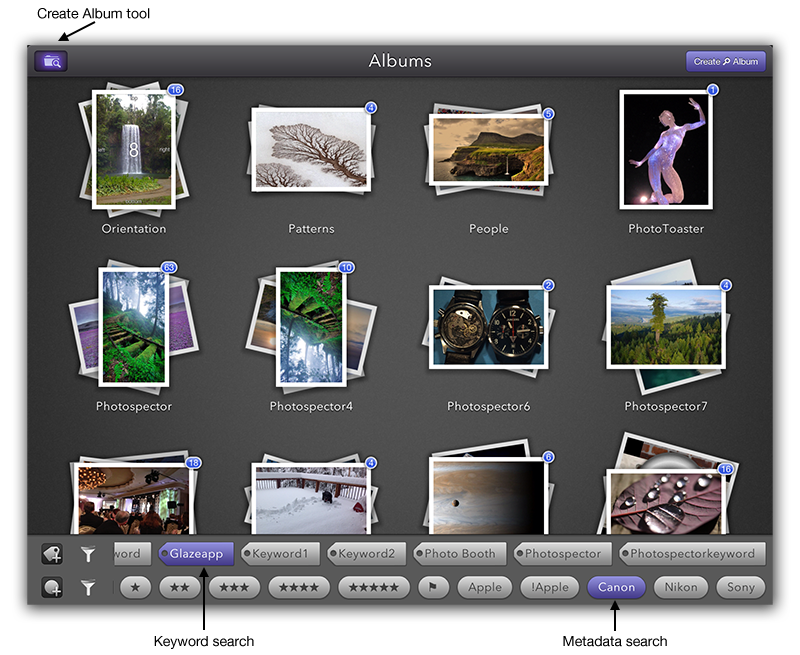 One of the features we are considering for future versions of Photospector are “input” albums that would be displayed in the initial Album View for cloud-based services like Dropbox, Facebook, and Flickr. These thumbnail stacks would allow you to import images from these cloud-based storage services just like you can currently import images from the albums in the device’s photo Gallery. Please let us know if this would be useful for you! 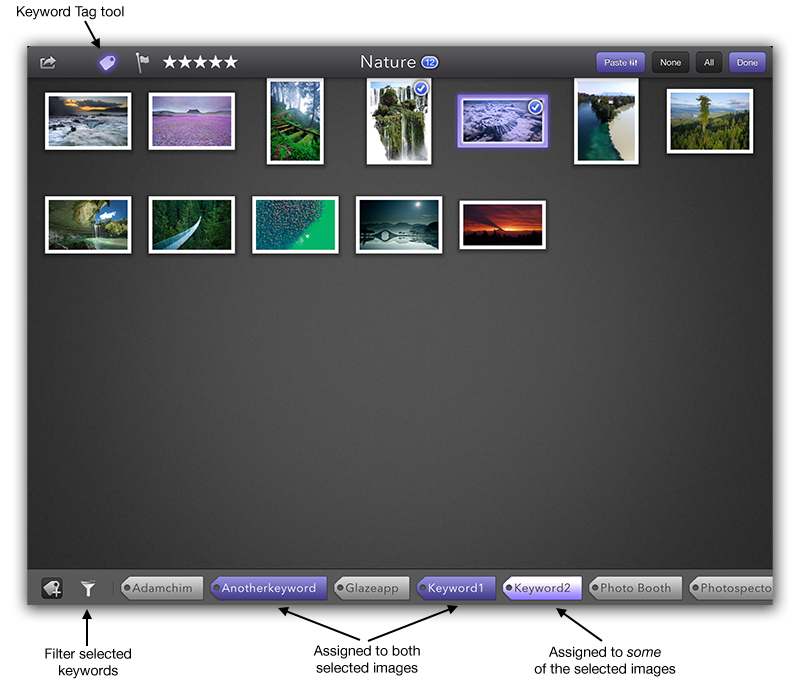 Photospector only allows you to edit the star rating and keywords of the image metadata. You can also strip off the metadata and add your own personal Author and Copyright information when you save out a new version of the image through the Sharing Tools. Read more in the blog about our advanced sharing options. You can edit the Star Ratings and Keywords for images either in the Image View or in the Group View using multiple selection. 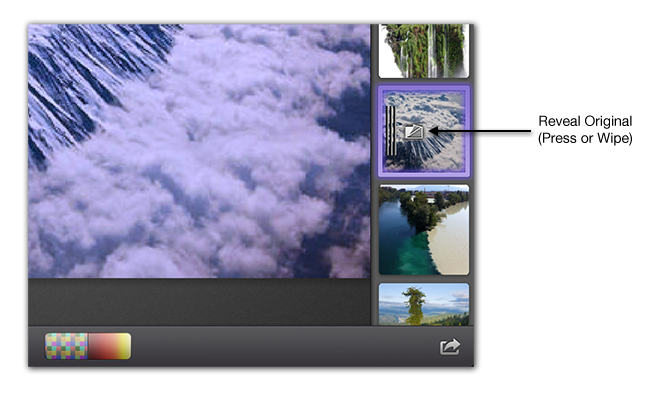 Using multiple selection in the Group View allows you to add keywords or rate groups of images together. In both views, the keywords that are currently assigned to the selected image(s) are shown in blue. You can use the “filter” button on the left side of the Keyword Tag Bar to show just the selected keywords (which may be spread out and not all visible if you have lots of keywords). In the Group View, if you select images and select the Keyword Tag Tool, the keywords assigned to all the selected images are shown in blue, and keywords that are assigned to only some of the selected images are shown in light blue. The tag tool allows you to assign and remove tags from images, but it also is a great way to see which tags are assigned to an image or group of images. Selecting the filter tool will show only tags that are assigned to one or more of the selected images. You can leave this enabled and toggle images or switch to and from the Image View and only ever see tags that are assigned to images. This is particularly useful if you have lots of tags with only a few of them assigned to each image. You can view and inspect all of the metadata for any image using the Metadata Tool, selected using the “info” button in the Image View at the bottom left of the screen (a circle with an ‘i’ inside). However, Photospector does not allow you to edit arbitrary fields in the metadata. If this is a feature you need, or if you need to edit a specific field, strip off a different subset of the metadata than we currently support when sharing, or have another suggestion about what metadata features we should add, please let us know! The controls on the left allow you to view individual red, green, blue or alpha channels as grayscale images. Only a single channel can be selected at any time, and you can turn off the channel inspection by tapping the selected channel. Similarly, you can either have random, heatmap or no color adjustments applied to the view. This can be useful for certain color correction operations, and it is also very helpful for images that contain data, rather than photos. For example, some programs can export images which are used as masks or to control parameters in editing operations. The alpha channel is helpful to examine for web-based work or compositing when you have images that contain elements that will be drawn on top of other background images. The heatmap and random viewing controls provide additional ways of viewing the channels. Instead of simple grayscale, you can color the channels with random colors or with a heatmap to reveal interesting details. The random colors are very helpful when comparing images that are almost identical. By selecting the random mode and toggling between the two similar images, individual pixel differences will jump out and become very obvious. 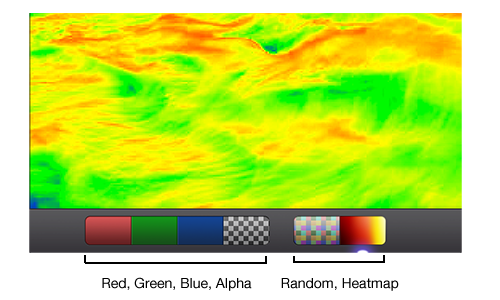 The heatmap is helpful when viewing soft gradients, along alpha channel edges or within images. Note that if you share an image with the color channels, heatmap or random modes selected, the image will be saved with those adjustments, saving what you see in the Image View. 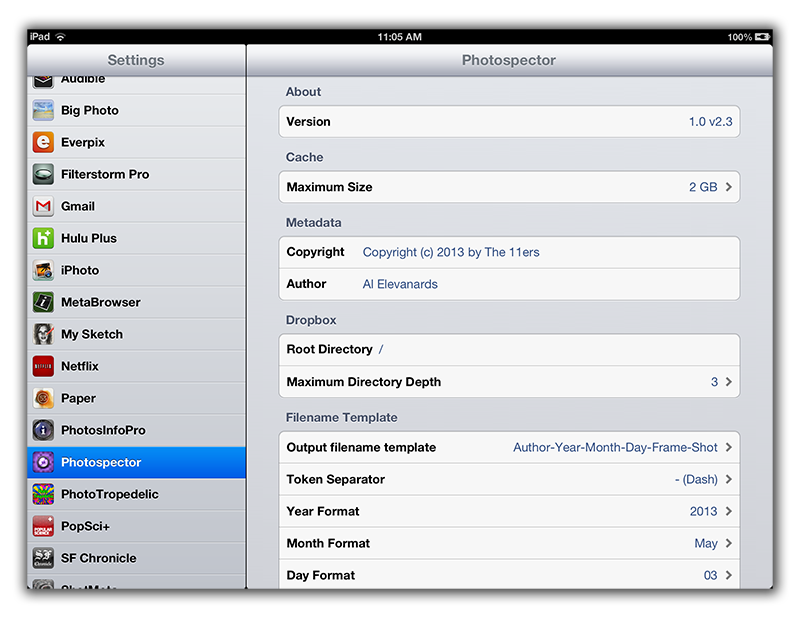 Photospector has a number of important preferences available within the Photospector tab of the Settings app. You can set the Author and Copyright strings that are stamped into your image metadata when you share, and control the format of filenames (for any sharing mode except the device Gallery where iOS dictates the filename). Read all about the advanced sharing options on our blog. IMPORTANT NOTE: You cannot change filenames or metadata for existing images stored locally on an iOS device. Apple does not allow any program to select a filename for images on the device or modify any of the contents, including the metadata. The filename template is only used when storing images to cloud services such as Dropbox, Facebook or Twitter. You can change the metadata for new images stored to the local device gallery, but you cannot change the metadata of an existing image without creating a copy. The filename formats control the form of filenames generated when sharing images to Email, Dropbox, & Facebook. The Shot Name is taken from the text input field in the sharing popover and the date is taken from your image metadata. If no date information is available inside the metadata, the date of the file on the iPad is used.